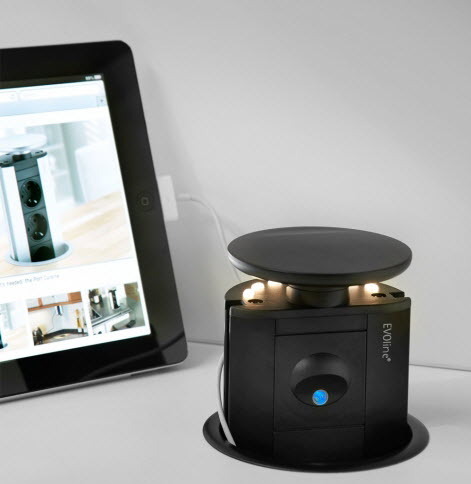 A pop up socket like no other, the EVOline Port takes electrical innovation to new heights. Pop up outlets appear and disappear from a workstation or desk surface. The port from EVOline offers the user convenient and tidy electrical outlets and data transfer ports. Easy to use, the port stands up vertically from the desk or work surface. When in use, exposing the plug sockets and other peripheral ports available for use. When you are done using the port, simply push downwards towards the work surface and the port will disappear. Under the desk, hidden under a unique, stylish surface. A truly bestselling EVOline Icon! However, the port also can have electrical cables plugged into it when it is in the retracted position. Which may mean that all electricals connected to the port don’t have to be disconnected when you want to hide the port under the work surface. 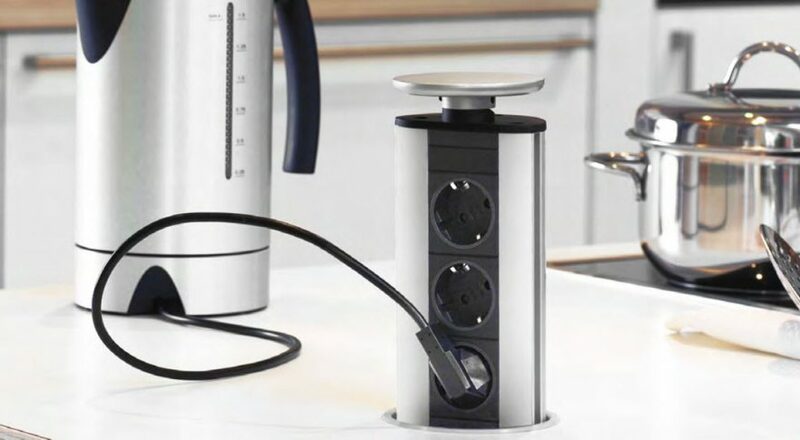 The port is a great alternative to extension cables and power strips as its vertical design means that when in use, it only takes up the size of its cross-section on the work surface. Or even when hidden and connected does not take up any space at all. When connected and pushed down, the only thing to notice is connected cables coming out underneath the rocking cover. The Port is available in various different models; specifically designed for a certain task and can be neatly pushed away when not in use. Thus keeping your workspace cable free and tidy. 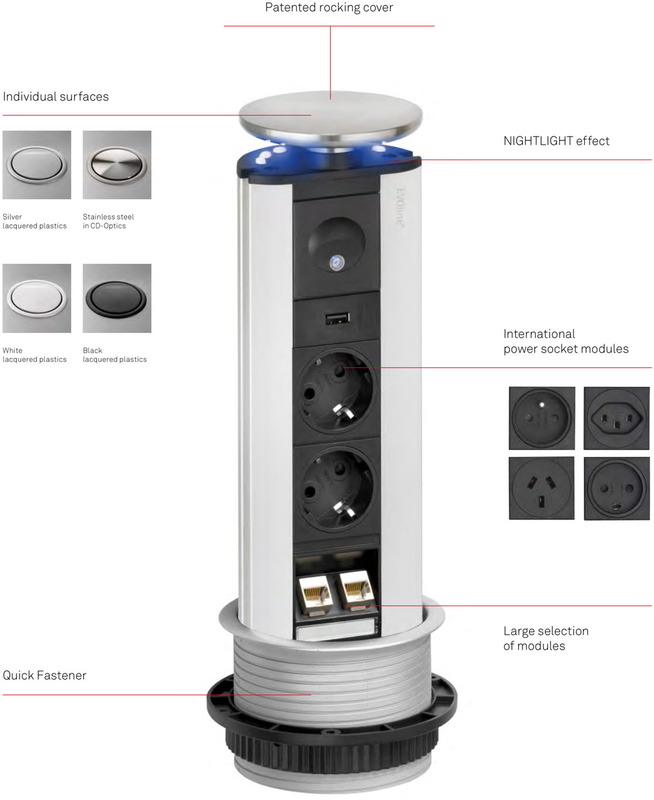 The power port is a pop up socket containing a number of electrical sockets, useful for when only power outlets are required, unlike other variations of the port, the power port only contains one type of socket. In contrast, the data port is a pop up socket containing ethernet ports and similar to the power port, an electrical outlet. The EVOline port comes in a range of different sizes as a standard for you to pick from. And if you need something more tailored to your needs, EVOline offers a custom design tool that enables the consumer to build a custom port for their specific needs. Using this design tool, the user can add sockets to or remove them from their custom port. There are extra options like the LED nightlight in several colors. Other options are the different profile and rocking cover colors. This essentially allows a ‘hybrid’ port to be made if you cannot decide which one suits you best. The EVOline port is useful for office, business, and private use. Allowing the user to hide the pop up socket away when not needed and due to its vertical design, it can be easily hidden behind desktop equipment, like computer screens etc. Although it does not look out of place when visible. Overall, the EVOline port is a revolutionary workspace outlet, combining well thought out design with space saving functionality, which makes it one of the best selling products at EVOline and would be a useful addition to anybody’s workstation.